Anthony Bourdain has 1 media appearance. The SAN FRANCISCO TRAVEL BOOK CLUB and LECTURE SERIES will discuss A Cook's Tour: Global Adventures in Extreme Cuisines by Anthony Bourdain. (Okemos) Anthony Bourdain Guts & Glory Tour at the Wharton Center! Anthony Bourdain will bring his Guts & Glory Tour to the Wharton Center for one night only, Tuesday, May 7th. Bourdain will spend the evening sharing candid, often hysterical insights about his life’s work and travels, including an open question and answer session with the audience. Copies of Bourdain’s books will be available for purchase on-site from Schuler Books, the show’s Official Bookstore Sponsor. Tickets are on sale now online at www.whartoncenter.com at the Auto-Owners Ticket Office at Wharton Center, or by calling 1-800-WHARTON. Anthony Bourdain discusses Medium Raw: A Bloody Valentine to the World of Food and the People Who Cook. Anthony Bourdain reads from Medium Raw: A Bloody Valentine to the World of Food and the People Who Cook. Event location: Bagdad Theater, 3702 Hawthorne Blvd. 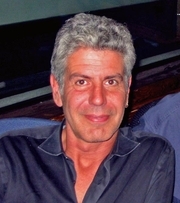 ANTHONY BOURDAIN reads from No Reservations: Around the World on an Empty Stomach. Anthony Bourdain is currently considered a "single author." If one or more works are by a distinct, homonymous authors, go ahead and split the author. Anthony Bourdain is composed of 16 names. You can examine and separate out names.